Yesterday I shared my ‘something for every single guy in your life and on your list’ Gift Guide for Him. And today, I’m back with the edition for all the special ladies in your life. While I won’t lie to you and say I’m not picking up one or two items off this list for myself (like this sparkly NYE contender) – for the most part I’ve got gifts in mind and this round-up will cover them all. Whether you’re looking for a cute under $25 gift for a co-worker, a new it-bag for your ‘she’s already got everything’ sister, a pop of preppy plaid for your always chic best friend or something to pamper your hard-working mama – it’s all here. Hover over the images above to shop or scroll down to browse by section. I’m doing all my homework (and adding to cart) this weekend so that I can be ready to hit ‘buy’ when Black Friday and Cyber Monday roll around (I’ll be your source for all those can’t miss sales too). Happy shopping! While I like to think I’m a pretty good gift giver – I’ll be the first to admit that the men on my list always feel the hardest to shop for. So this year I’m starting early – making a game plan and nailing it. And of course, sharing with you all what’s on my list! Below a gift for every special guy in your life. 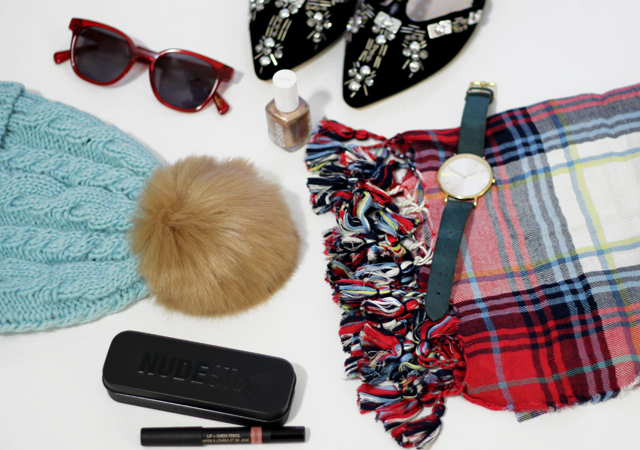 For your dapper Grandpa, a cozy plaid scarf. For your outdoorsy Dad, a great pair of leather boots. And for your music-loving brother, a waterproof speaker for singing in the shower. And pretty much everyone needs one of these carry-on cocktail kits in their stocking for the next long flight. No matter who’s on your list, I’ve got you covered below (you can also hover over the image above and click on the plus mark to take you directly to that item’s page). Happy shopping and happier holidays! p.s. Sign up for my newsletter on the homepage here and get my Gift Guide for Her sent to you tonight – a day before it hits the blog!